Exorbitant real estate prices are forcing Singaporean hoteliers to forsake the claustrophobic and expensive high-rise stretches of Orchard Road and Raffles Avenue in favour of more atmospheric ‘hoods. Taking up a row of six conservation shophouses in Chinatown’s historic Mosque Street, the 46-room Hotel Mono is the work of local studio, Spacedge Designs. 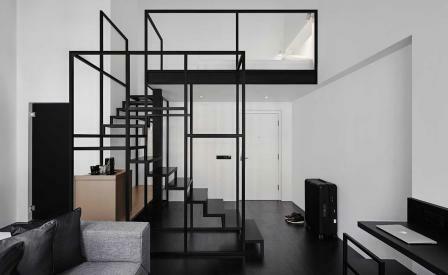 Owing to the peculiarities of the original floor plans, no two rooms are the same – save, that is, for a common black and white theme that’s anchored by a black metal bar that loops through each room and doubles as a light fixture, coat hanger and graphic installation. Even Eero Arnio’s red-lined ’Ball’ chair has been reupholstered in black fabric. The conservation restrictions also mean there are no facilities – not even a restaurant – but this is hardly a hardship given the hotel’s proximity to the smorgasbord of street food at nearby Maxwell Road Hawker Centre and upmarket eateries in Ann Siang Hill.